Valtteri Bottas has succeeded retired world champion Nico Rosberg as Lewis Hamilton's team-mate at Mercedes. The move, expected since December, also sees Brazilian Felipe Massa come out of retirement to replace the 27-year-old Finn at Williams. 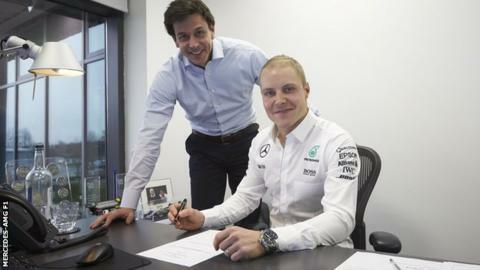 Bottas has signed a one-year deal with the option for more, while Rosberg moves into an ambassadorial role. Mercedes' young driver Pascal Wehrlein, passed over in favour of Bottas, joins the Swiss Sauber team. Rosberg's shock retirement, announced just five days after he wrapped up his maiden world title, was a "challenging situation for the team to handle", according to Mercedes team boss Toto Wolff. "Sometimes in life, unexpected circumstances provide interesting opportunities," he added. "Nico's decision in December was a big surprise. "But weathering the storm makes you more resilient and we see this as another opportunity for the team to grow. "I think Valtteri fits very well in our team, as a driver he's very fast, and he has also the heart in the right place. "He shares our values and passion, and he's modest and humble and he's hard working." For Bottas, the move is the opportunity of a lifetime. He has been in F1 for four seasons and has shown well at Williams alongside first Pastor Maldonado and then Massa. "It's very exciting times for me," said Bottas, whose best F1 results so far are two second places, at the British and German grands prix in 2014. "I think it's going to take a while to understand that this is really happening. "It's definitely another dream come true, to race in another team with such great history - especially in the recent years, which have been so impressive. "I think with Lewis we are going to be a strong pair together. I really respect him as a driver and a person. "I'm sure we are going to be close, and we're going to be both pushing each forward. I'm sure we can work as a team." Wolff has said he will end his ties with the personal management of Bottas' career now the driver is under his employment. Massa, 35, announced his retirement at the end of last season but quit F1 only because he knew he was not wanted at Williams and there was no other good seat available to him. A winner of 11 grands prix, he said: "Given the turn of events over the winter, I wish Valtteri all the best at Mercedes. "In turn, when I was offered the chance to help Williams with their 2017 F1 campaign, it felt like the right thing to do." Williams deputy team principal Claire Williams said: "With Valtteri having a unique opportunity to join the constructors' champions, we have been working hard to ensure that an agreement could be made with Mercedes. "Felipe has always been a much-loved member of the Williams family, and having the opportunity to work with him again is something we all look forward to. "Felipe rejoining us provides stability, experience and talent to help lead us forward. He is a great asset for us." Massa, who has signed a one-year deal, is an experienced and known quantity for Williams, who needed a driver over 25 to partner the 18-year-old Canadian rookie Lance Stroll as a result of their title sponsor, drinks giant Martini. Why did Mercedes not pick Wehrlein? Mercedes Formula 1 boss Wolff negotiated a deal to release Bottas from Williams because he believed Wehrlein was not yet ready for promotion. He turned to Sauber, who use engines from Mercedes' rivals Ferrari, to find a seat for the German to continue his development in F1. Wehrlein will partner Swede Marcus Ericsson in what will be his second season in the sport. The 22-year-old drove for Manor in his debut season last year but the British team are in administration and their participation in F1 in 2017 is in serious doubt. Sauber team boss Monisha Kaltenborn said Wehrlein had shown "talent throughout his career". She added: "Last year, in his rookie Formula 1 season, he proved his potential by scoring one point in the Austrian Grand Prix. "There is surely more to come from Pascal, and we want to give him the chance to further grow and learn at the pinnacle of motorsport." Wehrlein, whose move is likely to have been facilitated by financial support from Mercedes for Sauber, added: "It is a new challenge in a new team, and I am really excited and looking forward to this new adventure. "Our objective is to establish ourselves in the midfield and to score points on a regular basis."